These cookie cutters come in the shape of glasses that can be slotted together and warn as a party p..
Design you own Easter Egg cookies with this 9 piece cookie cutter set from Eddingtons. Set compri.. These 3 cookie cutters are styled as a funny face with bowler hat, glasses and smiling lips to creat..
9 Number cutters and storage tin made form high grade stainless steel. Very nice gauge of s..
9 Small Number cutters and storage tin made form high grade stainless steel. Very nice gaug..
Judge Set 6 Round 'Crinkle Edge' Metal Cutters. Set of 6 Top Quality Metal Biscu..
Judge Set 6 Round 'Straight Edge' Metal Cutters. Set of 6 Top Quality Metal Bisc..
6 heart shape steel cutters in a metal storage tin Size of storage tin is 11cm in diameter ..
- For cookies and food decoration - Made from uncoated stainless steel - Dishwasher ..
Make the perfect looking gingerbread man with this set of 2 dishwasher safe biscuit moulds. .. 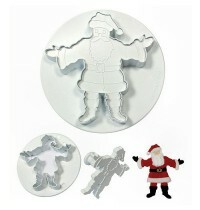 Create a decorative Santa cake decoration with this great cutter. It is simple to use and is ..
PME Veined Triple Holly Leaf plunger Cutter set of 2. Made from white durable plastic and easy t.. This clever plunger set allows you to make three different sized veined holly leafes from modelling ..
PME Veined Holly Leaf plunger cutters small set of 3. Small, Medium & Large Sizes. 36, 30 & .. Medium Reindeer Cutter makes a beautiful winter scene. Simply roll out fondant or marzipan thin,..
Sleigh Plunger Cutter makes a beautiful winter scene. Simply roll out fondant or marzipan thin, ..
Small Sleigh Plunger Cutter makes a beautiful winter scene. Simply roll out fondant or marzipan .. These small stars will look fabulous on Christmas cakes and cupcakes. Add a little shimmer or colour..